The UNP and its allies secured 106 seats at general election 2015 and the SLFP and its allies secured 95 seats. In the history of Parliamentary elections under the new Constitution only in two instances was a clear majority of 113 seats secured by the winning party. That was in 1989 when the UNP secured 125 seats amidst the JVP insurrection and in 2010 where the UPFA secured 144 seats soon after winning the war. In all other instances there were stable governments with the support of a section of the Opposition either supporting from the Opposition or joining the Government. If the Parliament was dissolved immediately after the presidential election in January 2015, the UNP would probably have secured sufficient majority in the Parliament. Also had the President dissolved the Parliament earlier, it would have been advantageous to the UNP. The President himself admitted this at the speech addressing the nation delivered soon before the general election 2015. If Rajapaksa continued to be the Chairman of the SLFP, there would be an exodus of MPs from the SLFP to the UNP soon after the presidential election. A few members left the SLFP and joined the UNP just before the general election after the SLFP gave nominations to Rajapaksa. In that case the battle-line was clear and the UNP would have been strengthened as a result. However, this did not happen since the leadership of the SLFP was handed over to the President. This was a strategic move by the ex-President and by the incumbent President as well. The Prime Minister, who initiated consensual politics well before the presidential election, proposed in the Draft Constitution of the UNP that the deputy chief minister of a provincial council should be the leader of the political party which came second in the election. He extended this to the Parliament as well. Therefore the thinking of the Prime Minister and the strategy of the President went hand in hand. Hence the Prime Minister has taken a policy decision after the presidential election not to accept SLFP MPs to his party. As a result it was planned to get SLFP support en bloc. However, this did not materialise since the President was not accepted well as the Leader of the SLFP within the rank and file. When he wanted to hand over his powers to the Parliament as promised at the presidential election, the SLFP objected to it and managed to dilute the essence of the 19th Amendment. The President managed to get certain control of the party after the general election with sacking the two Secretaries of the SLFP and the UPFA and appointing his loyalists to Parliament through the National List. 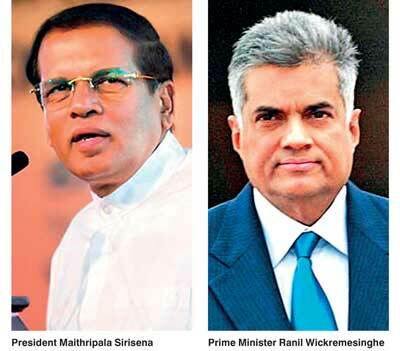 The Prime Minister and the UNP sacrificed a lot in favour of consensus politics. Consensus politics is needed to solve major obstacles faced by the country, namely to solve the ethnic issue, to pass a new Constitution and to face the UNHRC resolution. All are inter-related. The Government is not functioning effectively. The UNP in general was efficient in governance. But still they could not implement Budget proposals which were changed over and over again. Apart from the basic inefficiencies, the power struggle launched by the Rajapaksa faction also contributed to it. The President had to unusually enlarge the Cabinet in order to get more members from the Rajapaksa faction. Presently 37 members out of the estimated 43 members of UPFA who support the Government got portfolios of Cabinet Minister, State Minister or Deputy Minister; 86% of them got portfolios compared to only 50% of the UNP members who got portfolios (Table A). Irrespective of the patronage they obtained, SLFP ministers on and off had to say that they wanted to defeat the UNP and appoint their own Prime Minister as a result of consensus politics of the UNP and its Leader. This is as a reaction to the claims of the Rajapaksa faction. The President keeps on attacking Rajapaksa rather than engage in governing. Rajapaksa now tries to woo the Prime Minister and suggests that presidential system should be abolished not for the benefit of the country but to attack the President. It was said that if there are two factions of the SLFP, the UNP would be benefited in future elections. Therefore it looks like the tail is wagging the dog. The Government should act rather than react. At least they should know how to talk in one voice. The President should realise that his party is the minority partner of the Government and he himself was elected out of non-SLFP votes. During the time when Wickremesinghe was the Prime Minister in 2001, he did not apply consensus politics and the decisions were taken by him and not by the President. Now under the 19th Amendment to the Constitution, powers of the President were curtailed, partly as a result of the efforts of the President himself. Therefore, the real leader of the Government should be the Prime Minister and the President should respect that situation. It should be noted that the President’s act to curtail his own powers, quite contrary to the behaviour of his predecessor, mustered much respect to him locally as well as worldwide. However in the present context he cannot exercise the power to the extent that if his own party would be the principal partner of the coalition. He should learn to respect the view of the principal partner. There should be a common understanding of the two leaders to this effect and they should talk in one voice. Otherwise there is no point of talking about consensus politics and understanding between two major parties to solve the problems of the nation. There is no necessity of having a cold war under consensus politics. The Government is stable in numbers of the Parliament (Table A). With the recent crossovers it is estimated that there are 43 members of the UPFA with the Government. Hence 52 members are with Rajapaksa, including the Communist Party member who said he would act independently. With these 43 members and the 107 members of the UNP including the Muslim Congress member and the Speaker, the Government have 150 members, which is a two-third majority of the Parliament. This National Unity Government is for solving unresolved national problems as stated above which cannot be solved without the support of TNA. Therefore the Government is very stable and has sufficient numbers in the Parliament to address national issues. Civil society and the people who brought this Government into power need only that. Hence it may be the time to end the numbers game within the SLFP which cannot be greater than any national issue. According to Table A, all in all there are 91 Cabinet, State and Deputy Ministers and in this respect there is not much of a difference from the previous regime. People should be aware of the price they pay in order to adopt a new Constitution and to solve the ethnic problem once and for all. However if the country can in fact achieve those objectives, the price is cheap. Why does it look like the Government is unstable? It is because the SLFP and the President are in a numbers game with the Rajapaksa faction and the Government does not talk in one voice. Although it is not, it looks like they do not talk to each other and they express and exchange their views through public forums. Hence there is no policy consistency. We were thinking of solving national problems with consensus and now the Government does not have consensus even to increase VAT. Under these circumstances no foreign investor would invest in Sri Lanka even though the President, Prime Minister and the Government try hard to achieve it. The way to counter the threat of Rajapaksa if any is to work hard and do a good job rather than having kneejerk reactions and voicing different opinions; to speed the investigations and apprehend the real culprits rather than making way to believe that the Government is on a witch-hunt; and to tell the people the truth of the economic situation of the country and give a reasonable plan to overcome it.